Some people are gifted artists and are effortlessly able to create artistic masterpieces. For the rest of us, Foundations of Drawing gives not only a history of art, but useful information on the tools and techniques necessary to bring out your creative genius. Lavishly illustrated with many examples, the author begins with the encouraging reassurance that "anyone can learn to draw." The book then traces the history of drawing, from its supposedly romantic beginnings when young woman traced the outline of her war-bound boyfriend, to the more likely origins of cave paintings from over 700,000 years ago. The author notes how Picasso and other artists were influenced by these early cave drawings and made "conscious decisions to adopt alternative methods of drawing." That's always been my explanation, too . . .
After tracing the development of drawing through the centuries and various artistic movements, there is a discussion of the various materials that can be used for creating your masterpiece. In addition to giving a description of each type of material, the author also offers advice on how to use each one. The majority of the book is devoted to Essential Drawing Skills and Demonstrations, including techniques such as blending, texture and working with light and shade. Step-by-step instructions show how to begin and progress through such projects as drawing still lifes, animals and the human figure. After your work is done, there is information on using fixatives and storing your work. 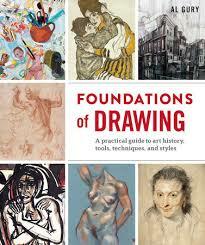 Whether you've always wanted to learn to draw, or are merely interested in art and art history, this book offers a great deal of in-depth information on the subject. Even if you don't plan to start drawing yourself, seeing how artists go about their work is fascinating.